Children who are under-responsive to sensory input, particularly movement and body awareness, may constantly fidget and change position. This is not just a subtle pencil tap or foot wiggle that most children will display from time to time. This is more like spontaneous somersaults across the living room and gravity-defying chair tilting on a constant basis. The vestibular system is the sensory system which helps monitor changes in head position and movement against gravity. Children who are under-responsive to this input need more intense and frequent stimulation than same-age peers. Everyday movement activities such as walking, playing or swinging are simply not enough to be satisfying and regulating. These lower intensity movements feel bland and leave under-responsive kids craving more (and higher! and faster!). This is the reason your child’s occupational therapist may recommend sensory diet activities that provide intense vestibular input for a child who is constantly on the move. Tools such as sit-n-spins, trampolines (with appropriate supervision and safety precautions), scooter boards, animal walks or structured exercises that include inverting the head may be useful in helping your child meet that high threshold that he needs to feel regulated. 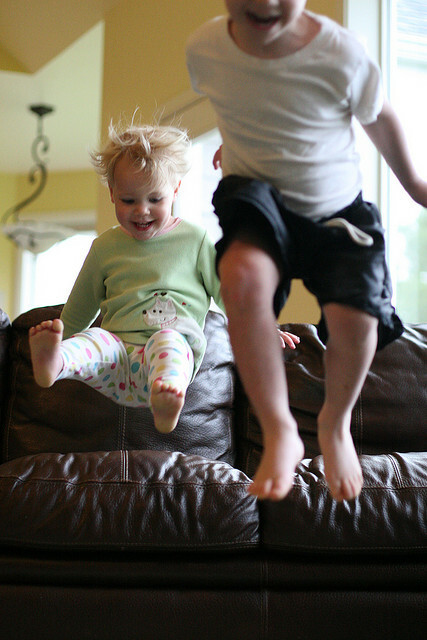 Our goal in suggesting these types of activities is to provide your child with safe, structured activities to take the place of body slamming the couch at Grandma’s house. If you have questions about sensory diet activities that may be beneficial to your child, talk about it with your occupational therapist.